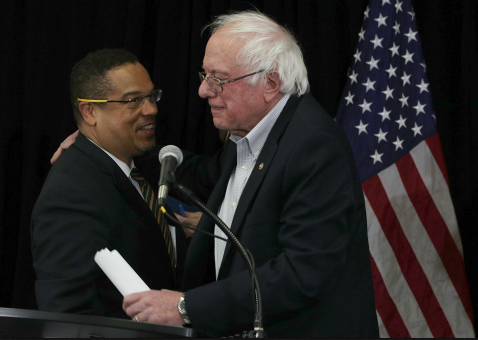 Sen. Bernie Sanders (I., Vt.) is one of Rep. Keith Ellison’s (D., Minn.) most prominent allies, but he didn't have any advice Thursday for Ellison in the face of domestic abuse allegations. Sanders said he had "nothing" when the Washington Post asked for his opinion on how Ellison should respond to his former girlfriend going public with abuse allegations last week, just before Ellison won the Democratic primary for attorney general of Minnesota Tuesday. "Nope, nothing," Sanders said Thursday, rushing for the Senate doors. "You’ll excuse me, I’ve got to get going." The congressman has denied the charges. His accuser Karen Monahan and her son claim there is a video of Ellison dragging her off a bed and shouting profanities, but she said she doesn't want to experience the embarrassment of making the video public. Ellison has become a leader in the Democratic Party’s left wing, rising to the DNC’s deputy chairmanship in the wake of the party’s historic defeat in 2016. In that election, he supported Sanders in his insurgent bid for the Democratic presidential nomination against Hillary Clinton. The DNC is reviewing the abuse allegations, and other prominent Democrats have deferred judgment. "I know that the DNC is investigating it, so we’ll see and let that run its course," Sen. Kamala Harris (D., Calif.) said. "I think that’s appropriate to look into it," Sen. Claire McCaskill (D., Mo.) said. "I think it’s going to depend on what the facts show," McCaskill added. Democrats faced a similar problem with a prominent Minnesota congressman last year, when half a dozen women accused then-Sen. Al Franken of sexual misconduct. While the Senate Ethics Committee opened up an investigation into the matter, many expressed dissatisfaction with Franken remaining in his position despite the existence of photographic evidence showing him putting his hands over a woman’s breasts while she slept. Eventually, female senators led by Kirsten Gillibrand (D., N.Y.) demanded Franken resign, which he decided to do at the end of the year. When Ellison won the primary Tuesday, he assured his supporters the charges against him are not true. One prominent Democrat calling for the party to distance itself from Ellison is Hillary Clinton's 2016 campaign manager Robby Mook. "I think we need to let the process play out to look if this is true. And if it's true, you know, I think he needs to be held accountable. I don't think people should be campaigning with him," Mook said. This entry was posted in Politics and tagged Bernie Sanders, Democratic Party, Keith Ellison. Bookmark the permalink.